Erica Chenoweth, a researcher and renowned specialist on nonviolent conflict and civil resistance and co-author with Maria Stephan on Why Civil Resistance Works: The Strategic Logic of Nonviolent Conflict (link below), engaged the participants with discussions on how those in power repress and how those in civil society can counter that repression. She argued that to be involved in a successful nonviolent movement, you don’t need to be a martyr and that “retreating and regrouping” is sometimes a wise strategy. “We can lose a battle, but win the war”. She also discussed the work of Brian Martin who studies how to manage repression to the best effect for a movement, so-called “backfire” (link to Martin’s book, Justice Ignited: The Dynamics of Backfire below). Erica Chenoweth and Maria J. Stephan. 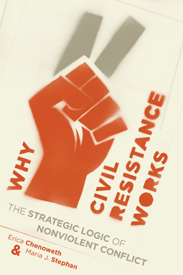 Why Civil Resistance Works: The Strategic Logic of Nonviolent Conflict (New York, NY: Columbia University Press, August 2011).